You don't need more time to write. You need a sustainable writing practice. Have you ever uttered these six words? Thought them? It's a common refrain for most writers. Between working full-time, raising families, packing lunches, preparing for meetings, attending events, exercise (or contemplating exercise), and myriad obligations, our desire to write is often buried deep in our hearts. What if instead of dreaming of writing a memoir, you wrote it? What if instead of wishing you could start a blog and find an audience for your message, you created it? What if you felt whole in all aspects of your life, including your writing? The thing is, finding time to write is less about time and more about your relationship to writing. Creating a sustainable writing practice isn't as simple as blocking off time in your calendar. It's not about quitting your job to write full-time. 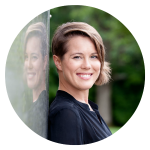 It's about getting to the root of how you became a writer in the first place, uncovering emotional blockages that keep you from the page, and honoring where you are right now. After diving into the emotional aspects of writing, you'll leave the program with clarity on the projects you need to work on at this stage in your life, and a custom designed, sustainable writing practice that supports your writing desires. You'll also have the opportunity to connect with fellow writers through a private and nurturing Facebook group where you'll receive additional support from Nicole during the four-week program. 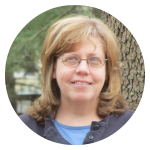 "Write Where You Are helped me identify my personal obstacles to writing, and find ways to get around them. Nicole enabled me to see how small nuggets of writing time can add up to completed goals. She's been there and done it, and she shares her real life experiences. I now have a focused list of writing projects and a renewed enthusiasm to complete them." In Week 1 we get to the core of who you are as a writer. First, we uncover your origin story, determine the emotional obstacles that keep you from writing, and identify plus the myths that hold you back. In Week 2, you learn three essential mindset shifts to transform your relationship to your writing practice, how your career is a partner in your creativity, and tips to avoid the comparison trap. Week 3 focuses on five writing archetypes (and why none of them are useful), creates new associations with the vocation of writing, and guides you through a process of professionalizing your writing journey. The course closes with the exact method I used to write my first book (while commuting, working full-time, and pregnant), breaks down the “I don’t have time to write” excuse, and provides a 5-step plan to create a sustainable writing practice that complements your lifestyle. 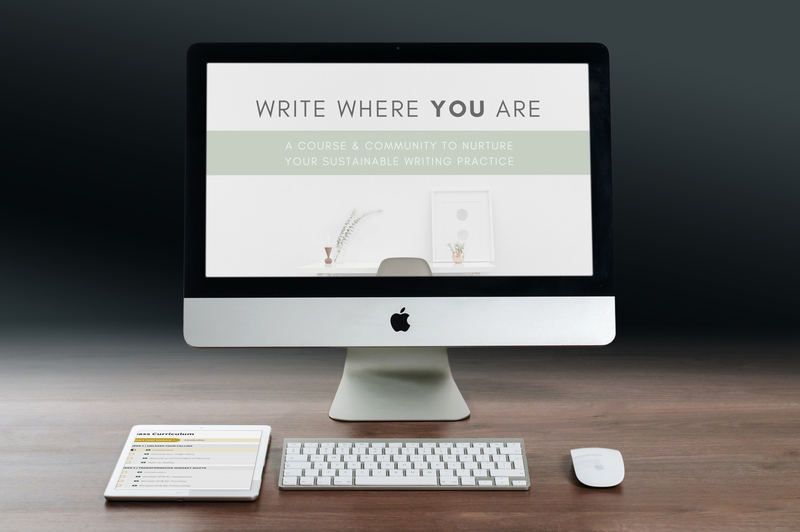 Write Where You Are is a 4-week online course to transform your writing practice. Although the content is accessible all at once, the Facebook group will be diving into the material on a weekly basis, so you have plenty of time to think about the exercises, ponder your writing journey, and make progress at a pace that feels good to you. The inaugural course launches August 8, and will run through the first week of September. If I'm not ready to invest in the course now, can I postpone? Yes and no. The course will be offered again (dates TBD), but the pricing is likely to increase in subsequent launches. When you enroll, you’ll have lifetime access to the course. This also includes any course materials that are updated or expanded upon in the future. Short answer: This course is non-refundable. Long answer: It was created with much love and intention to facilitate transformative mindset shifts in your life, and provide tools to help you create a thriving, sustainable writing practice over the long-term. Your investment in Write Where You Are is not so much in the course and community, but in yourself. You need to show up, take it seriously, and give yourself the time and space for breakthroughs to happen. The lessons bury themselves deep, and when you begin applying the sustainable writing practice formula to your life, you’ll continue experiencing changes in the weeks and months following the course. When you purchase this course, you agree not to distribute this course in part or entirety. This includes (but is not limited to) taking my information and distributing it through your own blog posts, ebooks, courses, and worksheets. Any repurposing of this content is prohibited. Nicole Gulotta is a writer, content developer, and tea drinker. She's the author of Eat This Poem: A Literary Feast of Recipes Inspired by Poetry, and pens a blog by the same name. (The book, incidentally, was written over a period of two years, mostly on her lunch breaks, while she worked a 9-5 job). She lives in Los Angeles with her husband, son, and French bulldog.